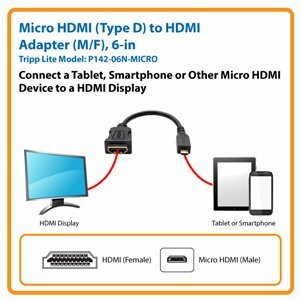 Tripp Lite 6in Micro HDMI to HDMI Adapter Converter HDMI Male Type D to HDMI Female M/F 6"
Tripp Lite’s P142-06N-MICRO DVI-D Female to HDMI Male 6-inch Adapter is an easy, inexpensive solution for connecting a tablet, smartphone or other Micro HDMI enabled device to a HDMI TV or display. This adapter supports high-resolution pictures, presentations or video up to 1080p resolution from a mobile device onto a HDMI monitor, TV or projector. Designed for use with mobile devices, the P142-06N-MICRO Micro HDMI to HDMI adapter uses premium components to ensure the highest performance and maximum ease of use with your personal electronics. The adapter is designed to work with devices using a Micro HDMI (Type D) connector. Unlike cut-price adapters, the P142-06N-MICRO is manufactured to exacting specifications, using superior materials, for optimal video performance. For peace of mind, the P142-06N-MICRO comes with a lifetime product warranty. The P142-06N-MICRO is manufactured using only top-quality materials. Its single-piece, molded construction ensures long-term functionality, while gold-plated connectors and 24K gold contacts minimize signal loss for optimal resolution. The P142-06N-MICRO’s small form factor makes it perfect for stowing away in a travel bag or briefcase. When you choose a genuine Tripp Lite connectivity product, you get superior performance plus peace of mind! We’re so confident of the quality of our P142-06N-MICRO HDMI adapter that we warrant it to be free from defects in material and workmanship—for life! Additionally, the P142-06N-MICRO is manufactured in compliance with strict RoHS specifications, reflecting Tripp Lite’s commitment to environmental responsibility.